Jack McGinn, Alex Sternburg, Matthew Ragan, Peter Bersani, Coach Chris Bersani. 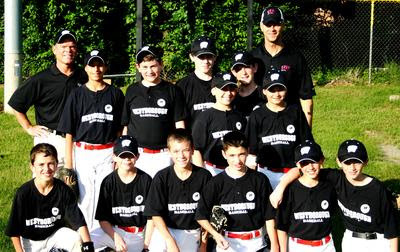 WESTBOROUGH, MA - After cruising through the regular season with a record of 13-1, Curry Printing defeated Civic Club to win the championship in the 10-to-12-year-old Majors Division of Westborough Little League. “This was a unique group of boys,” said manager Craig Nichols, who was assisted by coach Chris Bersani. Last year the team entered the playoffs seeded last out of seven teams, but managed to advance to the championship game before losing. “That experience last year of playing in big games really helped us this year – strengthened us as a team,” Nichols said. In the playoffs, which utilize a double elimination format, Curry was undefeated entering the championship round, while Civic, managed by Peter Casparriello, had incurred an earlier loss. In the first game of the championship series, Civic relied on strong pitching by Domenic Casparriello (who also hit an inside-the-park home run) to hand Curry a 5-1 defeat. In the second game, Curry pitcher Ryan Nichols struck out 12 batters in five innings, Peter Bersani went 3-3 at the plate (with two doubles), and Jack McGinn hit two home runs, leading Curry to a 12-7 win. Small and mid-sized active don't understand what identity theft can do to their business until it is too late. These thieves can gain access to key accounts and drain them, many times, before the bank is aware of the act. The cost of can be enormous and can shut a business down. There are three key steps every business must take to protect against this kind of crime. Criminals act quickly, so, a business must work hard to implement these key steps to protect its money, image and future.